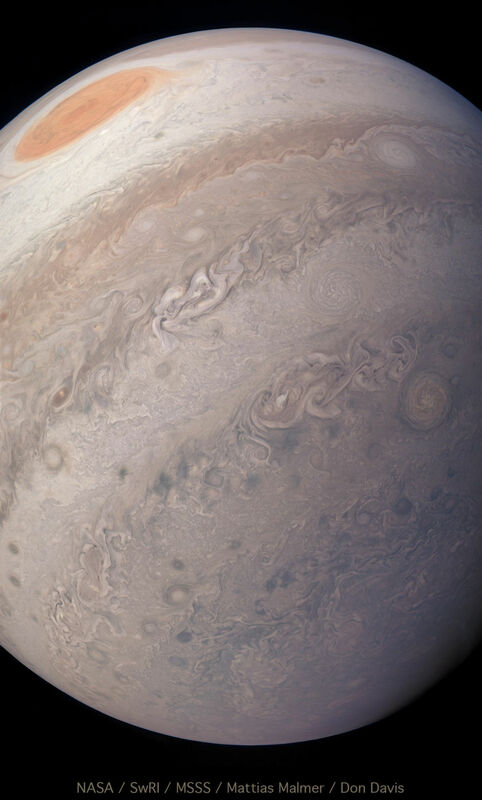 Because the JunoCam team depends upon the labor of volunteers to process their images for public consumption, there's been lovely diversity in the portrayal of Jupiter from Juno data. Many image processors chose to enhance and sharpen the subtle contrasts in the cloud features, but space artist Don Davis is usually after a perspective that rings true to our subjective judgment of what Jupiter ought to look like. 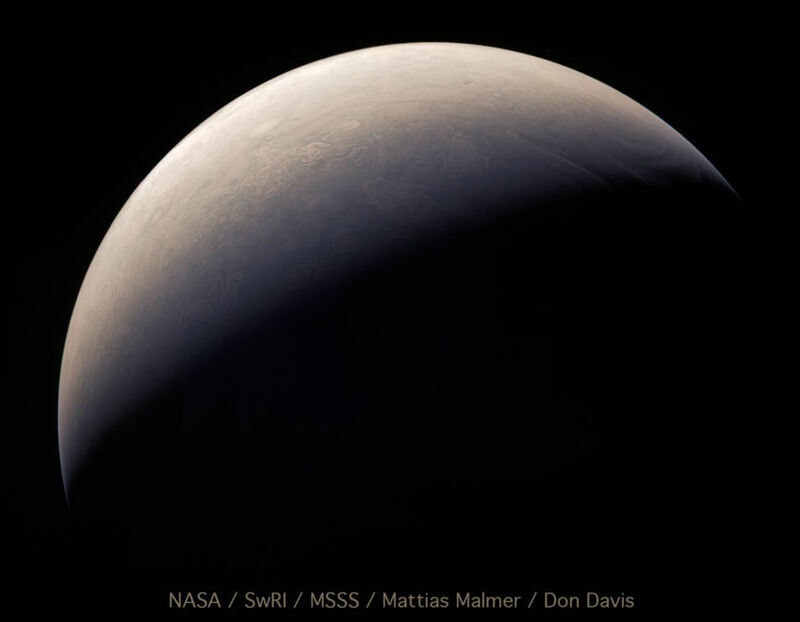 With the help of some preprocessing by Mattias Malmer, Davis presents us how Jupiter might have looked on April 1, 2018, if we'd been aboard Juno. A view made during Perijove 12, showing high altitude clouds extending beyond the terminator. This view of Jupiter was photographed April 1 by the JUNO spacecraft as it passed over the 'Northern Turbulent Region' just after Perijove 12 closest approach. Sharpening, contrast adjustment and color balancing were done across the raw color image using Photoshop to bring out detail and color while trying to suggest a visual impression. Mattias Malmer kindly supplied the raw RGB image he assembled. Here's a detail from that northern turbulent region. Look at the vertical relief on the clouds! A high resolution look at the clouds of Jupiter at about 10 km per pixel in the 'Northern Turbulent Region' in a region about 8800 km (5500 miles) across. This originally rather murky view was processed to bring out all the details and overall color I could. The tops of some clouds catch the light and show shaded sides, especially that huge bright upwelling at the lower right. Most of the very fine color detail should be regarded as spurious. 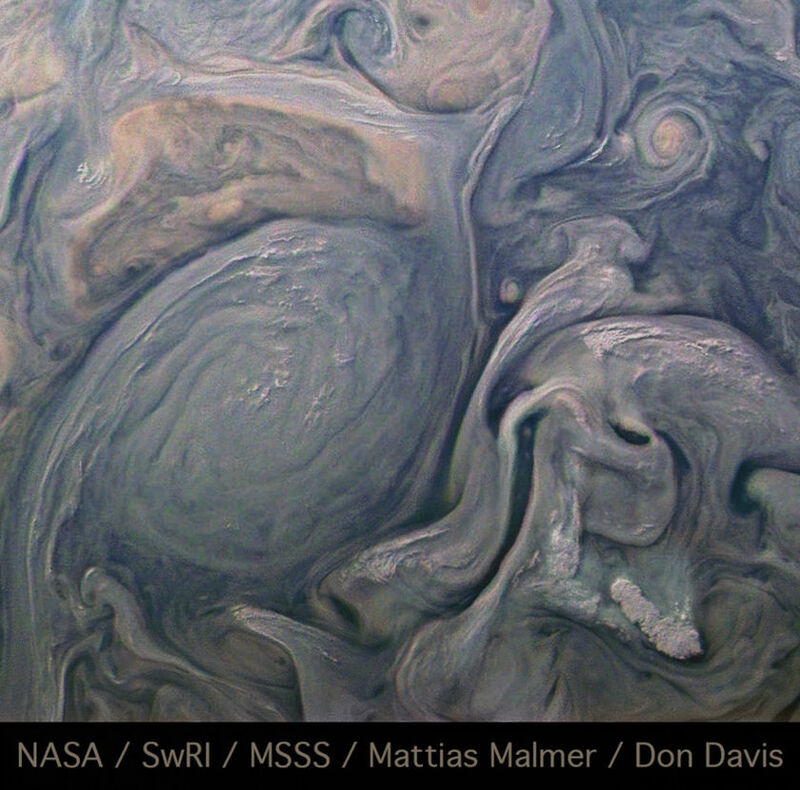 On April 1, 2018 the Juno spacecraft obtained a series of views of Jupiter's varied cloud details. Here we see The Great Red Spot in the one frame all of it was visible after it appeared over the horizon during the Juno's 12th close approach to Jupiter. And finally, just for fun: Davis compares Earth's clouds with Jupiter's, at the same scale. 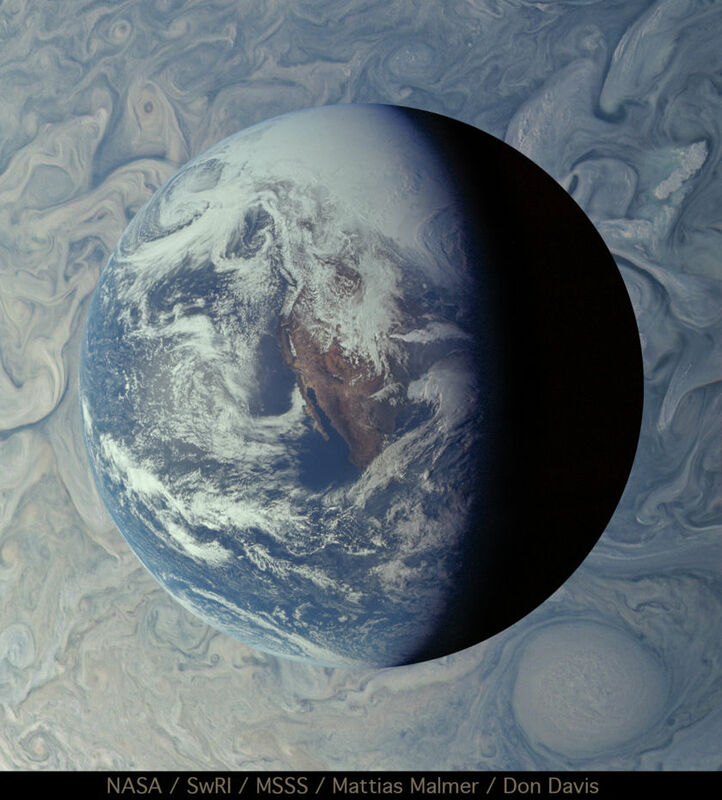 In this fanciful comparison, artist Don Davis has superimposed an Apollo 13 photo of Earth onto a Juno image of Jupiter's clouds at a similar scale, 10 km per pixel. Both show cloud details near the 'terminator' revealing shaded relief in the low sun angle. The size of even minor circular storms in the 'Northern Turbulent Region' is significant compared to Earth. I love all the art being created from the outer solar system! Me too! Although Saturn and the Cassini mission is by far my favorite, Juno is doing a wonderful job too. I'm curious, not understanding the colorization process, are the shades of gray assigned specific colors or is it all user dependent? JunoCam is the greatest publicity stunt in NASA's recent history. I don't think it was supposed to last this long...granted an engine failed and it's stuck in it's original orbit...but still....how long are they going to keep it and how long will JunoCam hold on before it dies?